Compost | How can I recycle this? 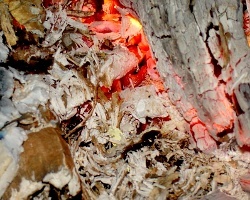 How can I reuse or recycle leached wood ash left over from lye making? What can I do with a lot of wood ash after it has been leached? I have a large firepit, and I plan on saving and leaching the ashes… but I’m very leery about tossing that much slag ash onto the compost heap. I’ve found lots of info about ashes before leaching, but practically nothing about after leaching. We’ve already covered the various different ways to reuse wood ash – from unpainted/unvarnished wood – in the garden and beyond — and one of those ways is to use it to make lye, which is what Bee is talking about here: the wood ash left after it’s been steeped to make lye for soapmaking or what-have-you. I haven’t made lye myself – we just compost the ash – and like Bee, my Google-fu has failed me. I can find lots of tutorials on how-to make lye from wood ash but they all just skip from making the lye solution to using the lye, without explaining the clean up. So does anyone know if the leftover ash is suitable for composting? I suspect it would be fine to go on a well-balanced compost heap – when “raw” wood ash is composted, the lye & salts leach away into the compost over time and the resulting compost will be alkaline but not too caustic to burn plants. 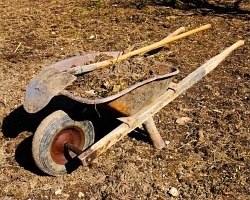 The leaching process will have removed a lot of the lye so in theory it shouldn’t damage your heap – although equally, there is less point in it being there because it contains less minerals than “raw” wood ash – better than being thrown into landfill but not going to add a lot of goodies to the garden. That’s what I think anyway, from looking at the situation now — I am very happy to be contradicted by someone who has had experience of composting it. Is there anything else that can be done with it? What would our ancestors – who wasted so very little – have done with it? How can I reuse or recycle apple peels & cores? 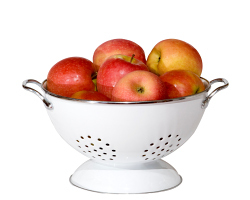 I just read this on Craftster, about making jelly from the peels and cores of apples. Seems like a nice way to use something that otherwise would be composted. Especially if you’re making apple pie or such like. No, I haven’t tried it yet, but I plan on it! And I follow your website, so just thought I’d pass along the link. The first page has the recipe, the second page has some info I didn’t know about how jelly jells and such. You have a lovely website – full of so many useful ideas! Great link, thanks! I love recipes that use up the bits of food usually thrown in the compost bin – especially at the moment when so many people are cooking up gluts of apples. Another reuse for apple peels is to make apple cider vinegar – either using a wild fermentation method or using cultivated winemaker’s yeast. We also feed chopped apple peel/cores to our chickens – an indirect way of putting them in the compost really. Any other suggestions? What do you do with your peels and cores? What can I reuse/recycle to make plant/vegetable fertilisers? So how is your garden/allotment/window box doing this summer? Due to a combination of a underestimation of seed germination rates, disorganisation/ignoring plans and demon slugs, my growing hasn’t gone quite as I thought it might but we’re doing ok and I’ve learned a lot about growing here. One thing definitely on my list for next year – well, technically later this year – is to give my beds a good old fashioned manure boost in late autumn. The soil here is very poor but since I reclaimed the beds from the weeds in early spring, I couldn’t do a manure feed this year and I think our output has suffered as a result. I’ve been feeding the seedlings/growing plants since then but I think better soil to start with would have helped overall. Ah well, live and learn. Anyway, homemade plant/vegetable fertilisers. I’m sure everyone reading this has a bulging compost heap for general compost goodness (if not, start one today!) but I thought it might be interesting to hear what kitchen scraps/plants/garden waste/household waste people use for specific fertilising/feeding plants at this time of year. I’ve been making/using a lot of liquid fertiliser from nettles this year because we have so many in the field next door to our house. Coffee grinds are also popular as a mid-season fertiliser, as are potash and bonemeal. What are your favourite produced-at-home fertilizers? Do you have any tips for particular plants? 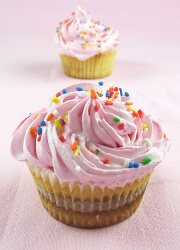 Can I compost those paper fairy cake cases? I’m presuming the question is about used ones rather than a box of new ones (you’re not going to use them? Freecycle!) and the answer is a big, definite ‘maybe’. The tiny cases I’ve got in my cupboard seem to be just paper so I’d probably risk those but other ones – particularly muffin cases and ones on bought-in cakes – tend to feel waxier. It might be that they’ve just been treated (supercalendered to make glassine) and are still just paper, but it also might be that they’ve been treated with a plasticizing agent, which may or may not be natural, and so may or may not be something you want in your compost heap. If you’re not sure of the composition of the material, it’s probably best leaving them out. How can I reuse or recycle sticky hard sweets/candy? Can I put sweets gone sticky in my compost bin? As with many “can I compost this?” questions, there is no fixed answer that applies 100% of the time in 100% of the situations. In a basic open heap, I’d say no – the sweetness may attracted unwanted insects and if it’s only breaking down slowly, you might end up with a sticky lump in the middle of your heap. Even when it does breakdown, they won’t add that many nutrients to your compost heap – in the same way they’re not exactly nutritious for us to eat either. 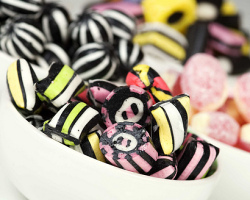 In other situations though, sugar can be good for a compost heap – it encourages bacteria growth in bins otherwise lacking (bins filled with leaves usually need more help than bins filled with a mix of stuff including kitchen waste) – so in that situation, you might want to add your sweeties. To avoid the sticky lump thing, you could try heating them up and making them into a runny sugar water solution. Said solution can also apparently be used to perk up weak plants – a soak for bare roots – or even, moving away from compost, overworked bees. What else can they be used to perk up?